In-screed DIY mats are ideal for installation under tiles or stone when a sand and cement bed is needed. The mats have a self-adhesive backing, making them very quick and easy to install. 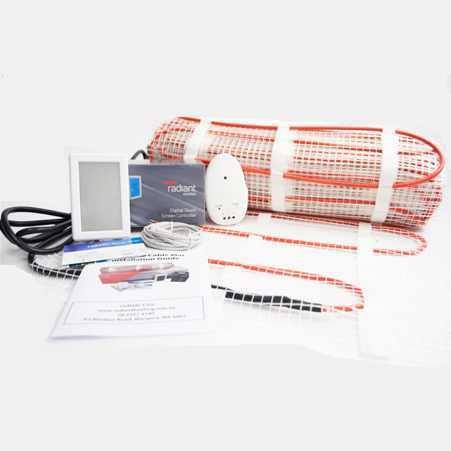 We recommend using an in-screed cable kit instead as they provide greater flexibility. If you are unsure, please don’t hesitate to contact us prior to purchase. Mats are manufactured using 6mm twin-core cable with built in earth and are 50cm wide, and rated at 150w per sqm or 200w per sqm. The typical room coverage, allowing for a gap around the edge of the room is about 80% of the actual free floor area. This is adequate to heat the entire room, however if you were to only heat a small area in the middle of the room, an additional heating source may be required to achieve the warmth you desire.